Please contact us for Lecture Pricing. If you are more then 50 miles away from us and have a no sales policy, the fee may be higher. Both of us are so inspired by nature! 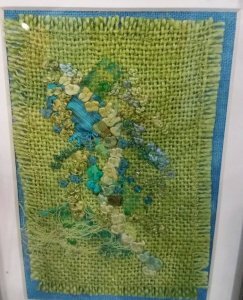 Whether we are using our own photographs, memories, or simply colors for inspiration we both drift towards making fiber art that revolves around nature. This lecture will delve into how to use challenges to inspire your work, photography, or simply the desire to learn a new technique. Art work demonstrates all these areas with a range of floral, tree themed, and seascape pieces. 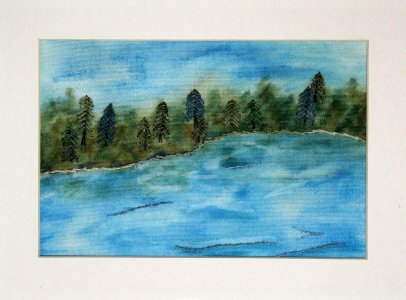 Forty years ago when I began quilting, I did so like many others using tradional patterns and techniques. 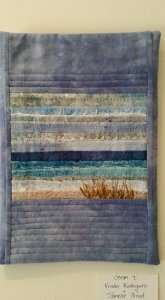 Soon I realized I didn't like the repitition of sewing traditional blocks, but I had an overwhelming need to creatively express myself and the tactile quality of fiber kept me in quilting. Following my own drummer, I began the exploration of a non-traditional styles. 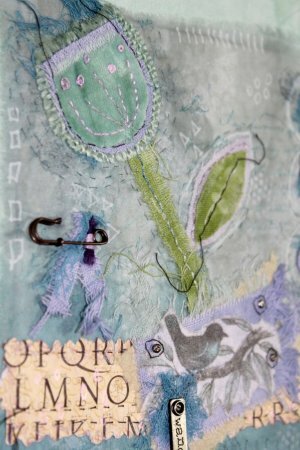 I have pursued a more contemporary quilting route, today finding myself working more and more in mixed-media to achieve that same "need" for creative expression. Using examples of what I do with all those stimulating creative ideas, words, phrases, photo's, magazine clippings or miscellaneous day to day ephemera. How to trap them before they escape my memory or grasp and are lost or gone forever. This lecture includes an unusual trunk show, from idea journals, scrapbooks, inspiration boards to the art piece that results. Of course I have more inspiration than finished items. Embellishing your quilts that is, at least I can't. I went from being a traditional quiltmaker to using anything that was within my line of vision, grasp and even my husbands stashes....okay, okay his "Collections", to embellish my work. There is a way to attach anything if you give it some creative thought. Trunk show included. Supply list will be emailed after booking confirmed. 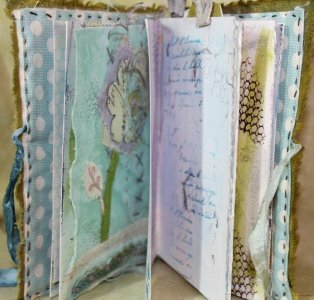 Create a little fabric book using a variety of surface design methods to create backgrounds for a variety of focal points (floral or bird themed). 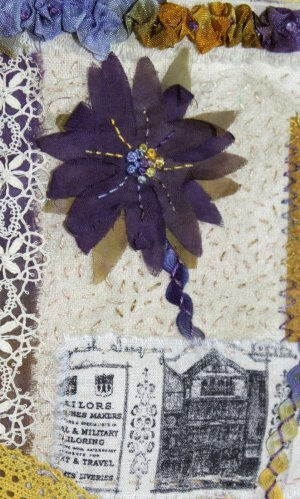 This book has a little of everything stamping, stenciling, screen printing, foiling, collage, embroidery, beading, wool applique, found objects, and more. It is hard to throw out those little pieces of hand-dyed fabrics from a previous project! 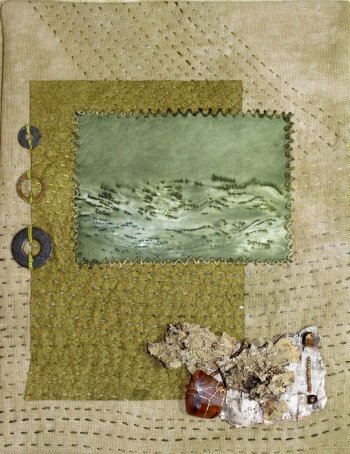 Those are all you need though to create a collaged background with a variety of textures/fibers for your next art quilt. 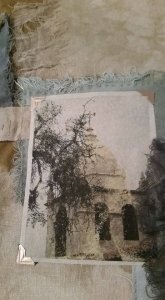 Use of a non-traditional fiber as the base for a photo transfer along with hand-quilting and embroidery round it out. As featured on Quilting Arts TV Series 1700. We all have strips leftover from previous projects. We can't seem to bring ourselves to toss out those hand-dyed beauties. You will learn how to use color and placement to create a small landscape that will be your focal point. You will use some hand-quilting and embroidery to really make it shine. Then we will discuss the various methods of display so that you may decide how to finish off your piece. 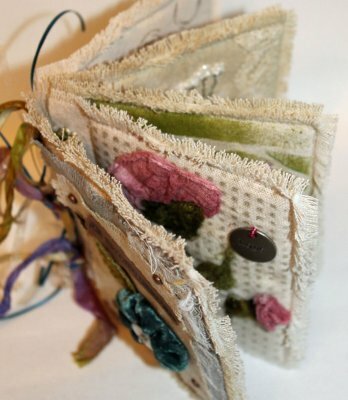 Create a miniature hand-stitched art quilt to cover your hard cover altered journal. Learn how to make signatures out of scrapbook and watercolor paper as well as paper grocery sacks. Use stamping, stenciling, and painting to add color to several of your book pages before learning a simple bookbinding technique to finish it off. Supply list will be emailed after booking confirmed. Do you collect "stuff"? Found objects, little things that hold memories or tell a story. Ever wonder how you can use them in a quilt? 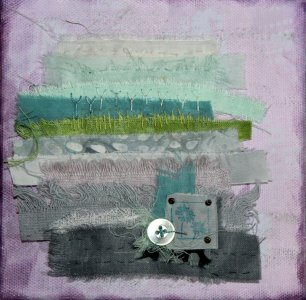 Create a small wall quilt using unconventional fabrics and hand stitching. Complete your design by creatively embellishing it with unusual items. Inktense gives you that painterly look without using paints or changing the hand of the fabric. Learn a variety of application techniques that will allow you to create bold, vibrant images or softer watercolor effects. 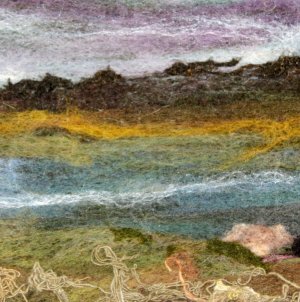 Paint a landscape with wool roving, other fibers, and a needlefelting tool. 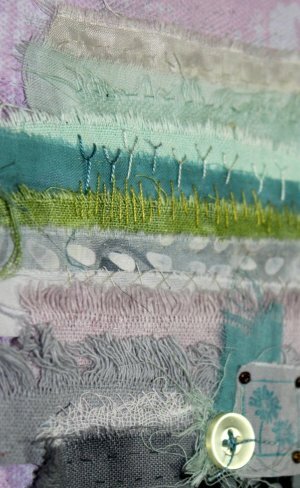 You will work with a variety of base fabrics to learn how they each give a different affect to your overall vista. 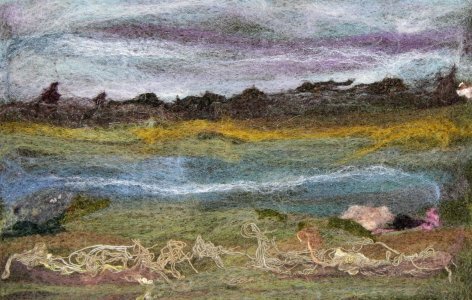 You will learn how to choose the appropriate fiber; wool, silk, or other, to create the landscape you desire. Funky birdhouses are the rage! 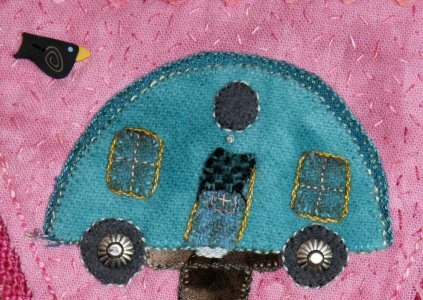 Mix a variety of textures like burlap, osnaburg, wool, lace, and embellishments together to create an adorable travel trailer bird house. 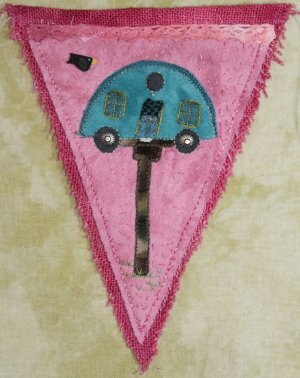 Add some simple hand stitching/embroidery to complete your triangular pennant. 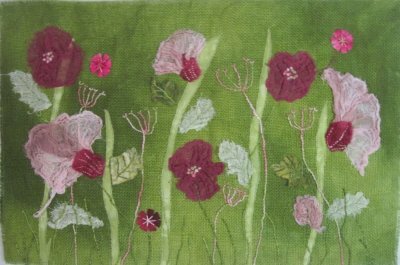 Little hand-stitching/embroidery projects are great for keeping your hands busy while on the go. Learn how to manipulate sheer textiles like organdy and cheesecloth to create layers for this dimensional flower, vintage inspired pennant. Ever wonder just how to use silk carrier rods/cocoons or even burlap? This class will focus on flowers and help you lose the fear of trying out those items. You will choose one of our Texture Packs in your favorite color way. 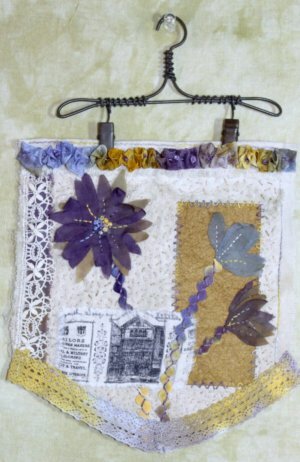 Using those items you will create an art quilt/wall hanging with some embroidery stitches covered to further enhance the piece. 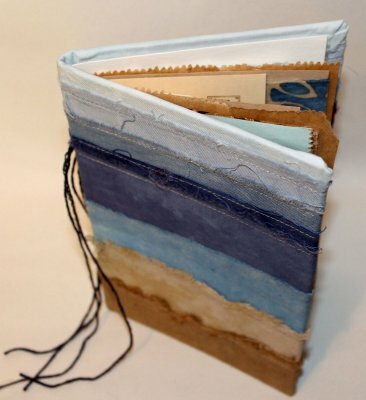 Make a small simple accordion style book the size of a postcard. 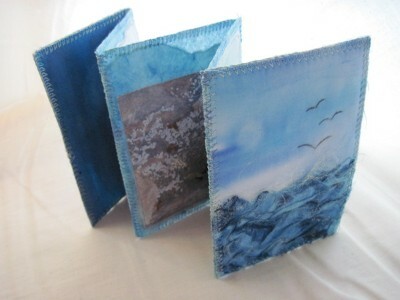 Use non-traditional supplies, such as Lutradur, Angelina, cheesecloth, watercolor paints, photo’s printed on fabric, embellishment’s and more to create your own unique book. You may choose to make each page individualized or your book may have one continuous theme. This is truly a mixed-media project. Want to step a little outside the box? 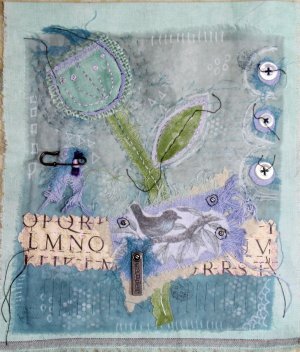 Learn a variety of mixed-media techniques to create unique to you fabric and papers. 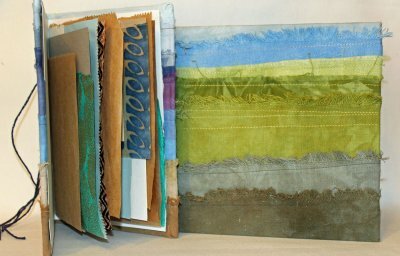 Then use them to create collaged covers, pages, and an accordion page pullout for your book. 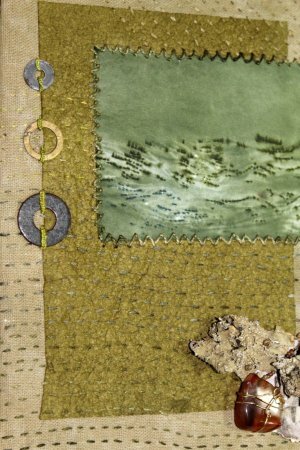 Create an abstract landscape using a variety of textures/types of fabric with hand stitching and embroidery. Then create a stamped focal point for your landscape and a painted canvas to mount it on. Small collages are quick creative outlets in between larger projects. 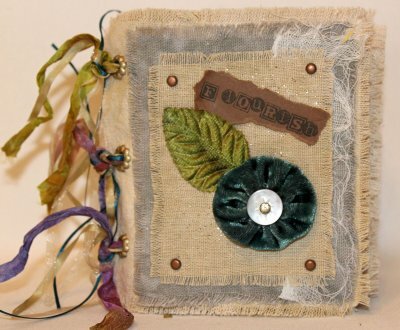 Use a variety of textured fabrics, scrapbook paper, and stamps to create this unique collage. 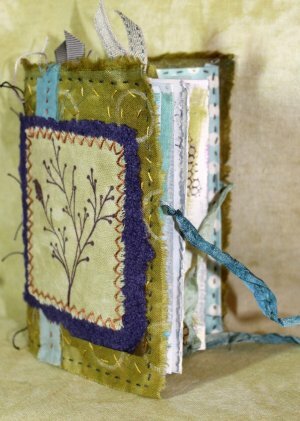 Finish it off with hand-stitching, embroidery, embellishments, and mark making.